Gorilla Glass, a technology invented by Corning, has already changed the mobile industry. But most consumers don't know the role Steve Jobs had in making that happen. Corning engineers invented the technology behind Gorilla Glass in the 1960s. At the time, they couldn't find any commercial applications for it so the project just stopped. Fast forward to 2006. Apple was finalizing materials for the upcoming iPhone, and Jobs was dissatisfied with the hard plastic that many phones, including the iPhone prototype, used for displays. The biggest complaint was that they scratched too easily. At the time, plastic was preferred because glass was considered too breakable for phones. So Jobs called the CEO of Corning to find out if that company could develop a super-hard, scratch-resistant glass for Apple products. Corning brought the old '60s project back to life and called it Gorilla Glass. Now, it's the standard for mobile devices and found in 600 million devices. A new version introduced this year, called Gorilla Glass 2, which is just as strong but 20% thinner, will help smartphones and tablets continue to get thinner and lighter without sacrificing durability. 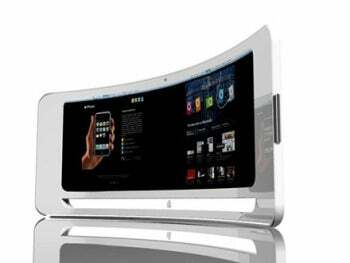 Corning has another glass technology that could really change things for consumer technology. The new glass is both flexible and very thin. The flexibility enables the manufacturing process to resemble how plastic is made, on factory rollers. It has all the scratch- and heat-resistance of glass. The company envisions the use of this technology to make wall-size touch displays, for example, and tiny mobile phones that are very thin, light and low cost. The company also announced this week a new glass technology that kills bacteria and viruses, including scary antibiotic-resistant super bugs. This will be great for medical tablets, and possibly for consumers. Glass is shiny and causes glare, which makes screens harder to read in bright light. It also reduces the efficiency of solar cells. MIT researchers this week announced a breakthrough in glass technology that solves the glare problem. The glass has a revolutionary surface pattern made of nano-scale cones of glass. It's called multifunctional glass. It's very clear, without glare or reflection. The glass also deflects water, which bounces right off. Car windshields using the glass, for example, would not need windshield wipers. More interestingly, solar cells under multifunctional glass would be self-cleaning and would enable more light to penetrate through the glass to the cells. It would be easy to imagine a phone like the iPhone 4 line with glass front and back, but with solar sells under the glass in the back. Smartphones, tablets, laptops and TVs would be essentially self-cleaning. No smudges and no glare! The researchers are working on a patent and intend to develop the technology for consumer electronics. What's great about all these ideas and technologies for consumer electronics glass is that they're all about to come to market over the next two years. They'll transform the shape, size, performance and functionality of everything we touch, and usher in a new world where glass is smart, clear, weatherproof, self-cleaning and cheap! This story, "Consumer Electronics Glass Innovation to Transform Industry" was originally published by Computerworld.